"Nothing tastes better on a summers day then smoked fish. This can be adapted for trout etc., but the flounder cooks quick. It might take a couple tries for the novice smoker to time it right, but the effort is worth it. These are great as a main course, or a snack during all day grilling sessions. We don't just fry fish down here, we smoke 'em! Besides, aren't you tired of flipping burgers like the rest of suburbia?" Preheat a smoker for high heat, about 350 degrees F (175 degrees C). If you do not have a smoker, prepare a grill for indirect heat. If you have a gas grill, stop here and find another recipe! Clean and scale a fresh flounder. I leave the head on for dramatic appearance, but most people panic at the sight. Use a sharp knife to make 3 or 4 diagonal slits on the body big enough for lemon slices. Slice half of the lemon into thin slices. Rub a light coating of olive oil over the fish, then squeeze the other half of the lemon over it, and rub in some black pepper. Rub or press 1 tablespoon of dill into the slits on the body, and insert lemon slices firmly. Place the flounder on a large piece of aluminum foil, and fold the sides up high around the fish. There should be enough foil to seal into a packet, although you want it open for now. Place the fish onto the grill or smoker, and throw a couple of handfuls of soaked wood chips onto the coals. Close the lid and smoke thoroughly for about 10 minutes. Once the fish has been flavored by the smoke, you can seal up the foil and move to direct heat if you like, but I prefer to smoke it until done. When the fish is done, the flesh should flake easily with a fork. 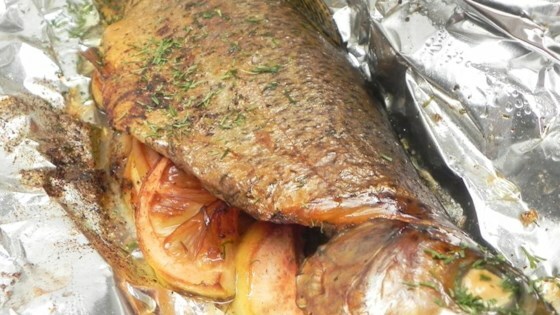 Remove the fish from the grill using the foil as a handle, and garnish with remaining fresh dill. Healthy baked flounder seasoned with the flavors of the Mediterranean. I prefer apple or other light wood chips for fish but oak, mesquite, or hickory will also work. You can prep four or five fish, seal them up, and hold them in the ice box until needed. last time I looked flounder was a flat fish!